1) In small microwavable bowl, microwave chocolate chips and condensed milk on High 1 to 2 minutes, stirring occasionally, until chips are melted. Stir until mixed well. Pour into glass dish, spreading evenly. 2) Drop marshmallow creme by tablespoonfuls randomly over chocolate mixture. Microwave on High about 30 seconds or until marshmallow creme is softened. 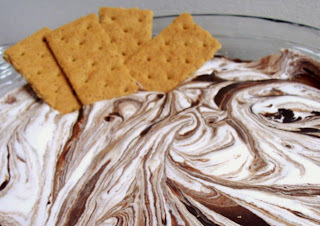 Immediately with a knife, make small swirls through the marshmallow and chocolate mixture, creating a marbled look. 3) Serve immediately with graham crackers!